Several scenarios faced the Scappoose boys basketball team after the Indians wrapped up their home schedule with a competitive loss on Tuesday to Valley Catholic. Depending upon the results from Thursday's Scappoose at Astoria game, the Indians could be headed to Tillamook for a Monday Cowapa League playoff game. Or they might be left waiting for the Oregon School Activities Association rankings to lock in next week to learn their postseason fate. In their final home game of the season, the Indians put up a strong challenge against a Valley Catholic team ranked sixth among Class 4A teams. 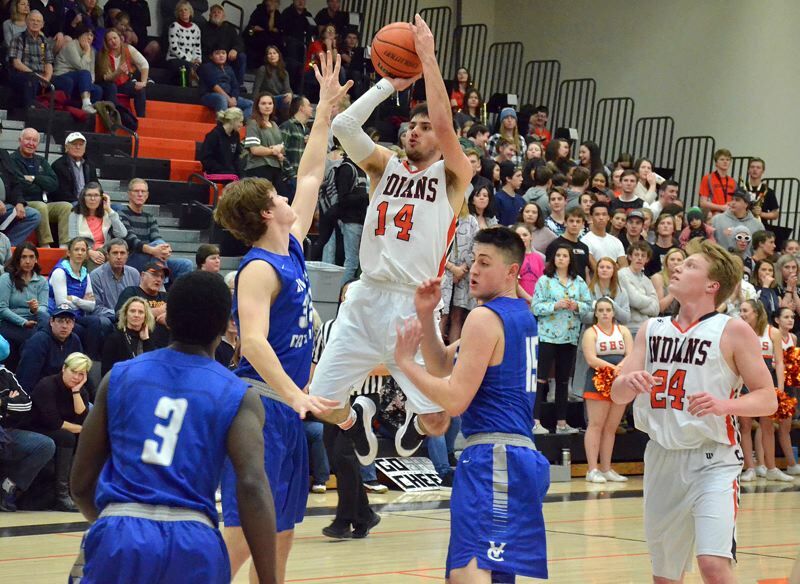 The Valiants, who played for the state title a season ago, used an 11-2 spurt in the middle of the fourth quarter to separate from the Indians on their way to a 69-57 win at Scappoose High School. Unlike the January game at Valley Catholic, which the Valiants won by 31 points, the Indians held their own in the rebounding battle on Tuesday. "From the game (at Valley Catholic) to the one here, it was like night and day," Scappoose coach Weston Powers said. "The way we defended (and) the way we helped down low on their bigs, who really hurt us last time." This time it was the outside shot that separated Valley Catholic from Scappoose. The Valiants made nine 3-pointers, several of them momentum-shifting shots. After Scappoose ran off 10 points in a row to tie the score at 34-34 midway through the third quarter, VC's Andrew Plembeck and Peter Boileau hit 3-pointers in a 10-2 VC answer. And when the Indians climbed back within five points, Plembeck — who scored 10 of his game-high 18 points in the fourth quarter — hit a big "three" with three minutes on the clock. "I was telling the guys, they've got 'trees' and 'threes,'" Powers said, describing Valley Catholic's size advantage. "You've got to stop the trees, so that's going to give them some (open) 3's. They stepped up and hit clutch shots." It started during the second quarter, when the Valiants hit five 3-pointers in a 24-point period that gave them a 32-24 halftime lead. Senior guards Chris Bendle and Joey Wagenknecht paced Scappoose with 16 points apiece in their final home game. Senior guard Jerad Toman added 11 points and senior forward Bradley Verbout had nine points. Junior Connor McNabb had three points and sophomore Tommy McKedy scored two. Toman collected eight of his points in the third quarter and sparked the 10-0 run that tied the score at 34-34 with a steal and two transition baskets. Toman pointed to defense as fueling the third-quarter rally. "We really wanted to box out and play really good defense, and then that opens up offense for us," Toman said. Wins have been tough to come by in the tough Cowapa League, but for the most part, improvement has been evident in the second round of league play. "I think we've improved a lot based on our defense," Toman said. "We're more of a team that's built on defense. Stop them, then push it up as fast as we can. We've got some skilled, fast guys." The Indians' fight was evident right to the final horn. Chasing down a loose ball in front of the Scappoose bench, Bendle and Wagenknecht collided. Both stayed on the floor for a few moments but were OK, according to Powers. Wagenknecht recently missed time with concussion symptoms. He returned to action in the Feb. 9 loss to Banks. The Indians could not keep pace with a motivated Braves team on Feb. 9 at Scappoose High School. Coming off its first loss of the season, top-ranked Banks jumped ahead early and never let Scappoose get close. The Braves led by 17 at halftime and 27 after three quarters. "It was tough catching them after their first loss of the year," Powers said. "They played really well and we didn't play well." Bendle scored 11 points for Scappoose, Verbout added seven points, Toman six, Werneck five McKedy four and Gavin Potwin two. Banks was led by 18 points from 6-7 junior Blake Gobel and 16 from 6-6 senior Dalton Renne.